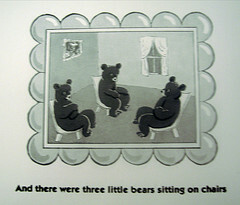 Is it just me or has anyone else had the thought, while reading Goodnight Moon for the umpteenth time, that the three little bears look like they’re in a group therapy session? I imagine that they are all experiencing Post Traumatic Stress Disorder after finding that their house had been broken into by some forward little trollop with yellow curls. They feel violated and Mama Bear complains that Baby Bear won’t even sleep upstairs anymore. And their favorite breakfast food, porridge, just doesn’t taste the same anymore, they keep finding imaginary long curly hairs in it. Now this is starting to sound like the plot of a Billy Collins poem. Too bad I can’t think of a clever twist for the end. Evidently it’s not just me. I found this while looking for a picture to put on my post. When Mary was little, she would draw some very nice work. So I took some of them and framed them with dates & name. Someday she may like to put them up on her wall. I’d say this one is a “keeper”.